Access Alliance has created a Knowledge Sharing and Networking (KN) Hub on refugee research to facilitate collaboration and synergy between current research projects on refugees in Canada, particularly those focused on Syrian refugee community. If your study team would like to join this KN hub, please fill out the Project Information Form, and send back to [email protected]. OCASI wrote to Ahmed Hussen, Patty Hadju and Maryam Monsef to congratulate the Ministers on their new Cabinet appointment and to introduce the Council and our priorities. Follow the link to read the OCASI letters to the Ministers. OCASI supports immigrant and refugee serving organizations in Ontario to address the mental health needs of clients through dialogue & collaboration, and in-person & online training for front line workers. Training is provided by Hong Fook, CCVT, and St. Michael’s Hospital. For more information, please refer to the OCASI website. Are you a settlement worker serving resettled refugees or claimants? Help build a Refugee Settlement Community of Practice! Please complete a short anonymous survey on challenges related to recently arrived refugees and useful training and resources for frontline settlement workers. The survey closes Friday, February 3. A summary of results and recommendations will be reported to IRCC. Metro Toronto Chinese and Southeast Asian Legal Clinic is launching an Ontario-wide 1-800 number to provide summary legal advice and information to low income, non-English speaking Chinese, Vietnamese, Laotian and Cambodian residents. Please complete the survey on the services your agency provides to help give better and more accurate service referrals to clients, by February 10, 2017. The awards recognize the outstanding contributions of individuals, groups, non-profits or businesses. Employment and Social Development Canada is calling for nominations by February 3, 2017. Award winners will be recognized at a ceremony and will be able to choose a not-for-profit organization to receive a grant of $5,000 (regional award) or $10,000 (national award). Participate in the Canadian Council for Refugees Winter Working Group meetings, 24 + 25 February 2017 in Toronto. Join participants from across Canada to develop strategies, collaboration, information on protecting refugees and vulnerable migrants. Open to all (closed to media and government)|No cost |No advance registration. 9:30 am to 5:00 pm @ Salvation Army, 160 Jarvis St. Toronto. 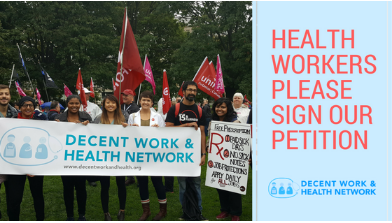 As flu season begins, Ontario’s doctors, nurses and other health workers repeat their call for paid sick days for all Ontarians. The Canadian Mental Health Association (CMHA) National is hosting their second Annual National Conference in September 2017. The 2017 conference theme is It Takes a Nation and submissions for abstracts will be accepted until February 24, 2016. Ontario Seniors' Secretariat is accepting applications for the Seniors Community Grant Program until March 3, 2017. Priorities this year are projects focusing on raising public awareness and prevention of elder abuse. Projects must be conducted between June 15, 2017 and March 31, 2018.